Remember when I wrote about our New Year's Eve pizza bonanza, and my idea that getting all that unexpected free pizza was a sign that 2012 would bring us "more than we expected" in other ways? Well, it has. But not necessarily in a good way. Sure, the weather has been delightful instead of frightful. But that's about all I can say. Last night at choir rehearsal I learned another friend had been diagnosed with advanced breast cancer, while another had suffered a serious mental collapse, and a third was in the hospital following a possible "brain bleed." My mental worry list has now stretched even farther across my brain, adding these folks to my heightened concerns about my dad, and my sadness over the impending death of my neighbor. When we came home from rehearsal, I went outside with the dogs. It finally turned cold and blustery, and I was trying to hurry them inside. As I followed them through the back door, I tripped over my own toes and went sprawling on my face, landing my entire weight <crack> on the bridge of my nose. And in case you ever wondered - yes, you do see stars. And yes, there is an obvious, tiny broken spot just south of the bridge. I'd like to start January over, please. I'm declaring this National Do Over week. Let's do the Etch-A-Sketch trick, shake up the past two weeks, and erase them so we can start again with more positive experiences this time around. How about you? Has your year so far been delightful or frightful? 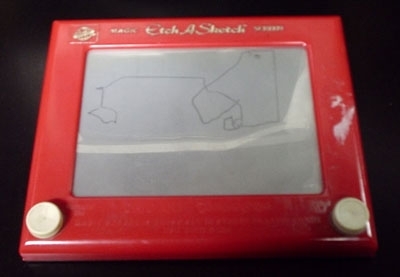 Do you remember a toy called the Etch-A-Sketch? It was an 8 x 10 screen encased in red plastic with two knobs that, when turned, created thin graphite lines on the screen. It was one of my favorite childhood toys. The downside was that you could only draw vertical lines - but since I wasn't much of an artist, it didn't really matter to me. One of my favorite things to do was twist and turn those knobs almost maniacally, until the entire screen was black with graphite shavings. Then I'd turn the Etch-A-Sketch upside down, give it couple of swift shakes, and all the lines would disappear. I feel somewhat the same way on the days leading up to January 1 each year. I scurry around trying to tie up all the loose ends of the Old Year before I turn my life upside down and shake it to start January 1 with a clean slate. This year was one of new beginnings - I left my job while my husband returned to his. 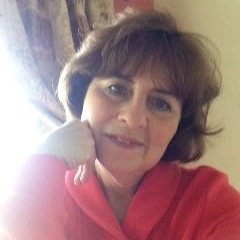 I started spending more time on my writing, and took a writing class which was exciting and enlightening. My son and daughter in law moved from Florida to Texas, and promptly embarked upon the ultimate fresh start - a new baby, our grandson Connor, who was born on November 14. I want 2012 to be a year of more new beginnings. I want to find my way into more creative outlets, especially musical ones. We hope to move to a new home in 2012, a major undertaking that we've put off for our entire adult lives and one that is long overdue. I want to be excited about that, and embrace the idea of this change with enthusiasm and positive energy. There is likely to be sadness and loss during 2012. When you reach our stage of life, it seems almost inevitable. But I hope whatever losses do come are tempered with enough joy to make them bearable. On this last weekend of 2011, I hope you are reflecting on the positive elements of this past year, and looking forward with eager anticipation to new challenges and experiences in the year ahead. Go ahead - shake it up and turn it over.